With Allah telling us how to lead our lives in the Quran in such minute detail one important aspect of living our lives is in keeping promises. Promises that Allah’s creation makes with other creations. Allah, too, makes promises but Allah’s promises in the Quran are extremely different from the promises that we make as Muslims to each other. 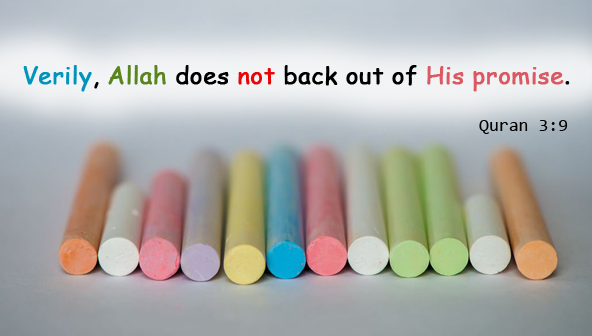 Allah’s promises never break! However, Allah has asked all Muslims to fulfill their promises just like the Holy Prophet Mohammad PBUH did. The Holy Prophet was known for his promise keeping so widely that even his enemies used to entrust him with their belongings. Allah wants us to reach that level of trust with our fellow Muslims. In the Quran the attribute of Allah keeping His promises and us keeping our promises has been mentioned numerous times. Allah says in the Quran: “And be true to every promise, for verily you will be called to account for every promise which you have made.” (17:34) On the Day of Judgment Allah will ask you about every promise that you made to another and whether you kept that promise or not. It doesn’t matter if it was as small as you promising to return a friend a pen or you promising to return a friend a huge amount of money. Any promise that is unfulfilled will be asked about. And you must not be in a situation where you have no answer for Allah. If you find that you cannot fulfill a certain promise then don’t make the promise in the first place. Because a broken promise gives the person greater heartbreak than a promise never made. Allah says in the Quran “Indeed, Allah loves those who act justly. (Quran 49:9)” When we use the term justice it does not mean to only show fairness in a trial of court. Rather it also means to be fair in all walks of life, in keeping promises and fulfilling them, in doing good to fellow Muslims and to follow Allah’s commandments. We are lucky to have a Being with us who will never ever NOT fulfill His promises. When we believe that of Him, then must we not try to be the same? Must we not try to also practice what we ourselves are receiving? May Allah make it easy for us to fulfill all our promises to people and the main promise to Allah to follow His path and become good Muslims. Ameen.